India and Japan first-ever joint military exercise named as “Dharma Guardian” will be held at the Army’s Counter-Insurgency Warfare School at Vairengte in Mizoram, India. 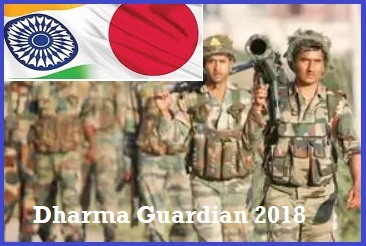 India and Japan joint military exercise “Dharma Guardian” is 2 weeks exercise scheduled to take place from 1st November 2018 to 14th November 2018. The Dharma Guardian joint military exercise is aimed at developing mutual understanding and respect between militaries of India and Japan, as also facilitate in tracking worldwide phenomenon of terrorism. The focus of this exercise will be on building interoperability. India and Japan armies will jointly train, plan and execute a series of well-developed tactical drills for neutralization of likely threats that may be encountered in urban warfare scenario. Moreover, experts from both sides will also hold detailed discussions to share their expertise on varied operational aspects. The Dharma Guardian joint military exercise, Indian Army will be represented by 6/1 Gorkha Rifles, while Japanese Ground Self-Defence Force will field its 32 Infantry Regiment. As per current scenario, India and Japan have been steadily stepping up their bilateral defence ties, with more military exchanges, training programmes, and top-level visits as well as collaboration in maritime security and defence production, with an eye firmly on an aggressive and expansionist China. Exercise Dharma Guardian will be another step to deepen bilateral strategic ties. Such exercise will be an effective diplomatic tool to enhance overall strategic ties and military-to-military cooperation between both friendly countries.